Peer-to-peer platforms have cropped up in various industries over the past decade, and refer to online websites that match supply with demand. For example, Prosper is a peer-to-peer lending platform that matches lenders and investors who are willing to loan them money. But what is a peer-to-peer trading platform? The idea is so revolutionary in the world of stock market trading that it takes a few moments to get your head around it. In a nutshell, it refers to matching buyers and sellers of a particular stock without relying on a stockbroker. Usually when you purchase a stock like Amazon via a broker, such as TD Ameritrade, the broker facilitates the trade. But what you may not have known is your order may be sold to a middleman who takes a cut, causing you to pay higher transaction fees. If only there were a way to match orders directly between buyers and sellers? Well now there is a way and it is referred to as an Alternative Trading System (ATS), a regulatory term for a non-exchange trading venue that matches buyers and sellers to find counterparties for transactions. And Ustocktrade is one of the leading ATS systems available to traders with transaction costs amounting to just $1 per trade. But what else do you need to know about Ustocktrade before deciding whether it is right for you? Why Trade On A Peer-To-Peer Platform? Is Ustocktrade Right For You? Ustocktrade directly matches the orders of buyers and sellers to create a low-cost way to acquire and dispose of stock, exchange-traded funds, and exchange-traded notes. A peer-to-peer platform has a clear benefit versus most brokerage firms. When you place an order via a typical broker, your order is routed to an exchange where various middlemen take a cut, resulting in higher transaction costs over time. However, a peer-to-peer trading platform directly matches buy and sell orders. If you want to purchase shares of Facebook and another member on the platform wishes to sell their Facebook shares, Ustocktrade will match you both and save you the costs that you would otherwise be forced to pay at a traditional brokerage firm. Peer-to-peer trading platforms aren’t some fly-by-night, cockamamie, half-baked idea that some enterprising entrepreneur conjured up. They are regulated by the SEC and officially labeled as Alternative Trading Systems. 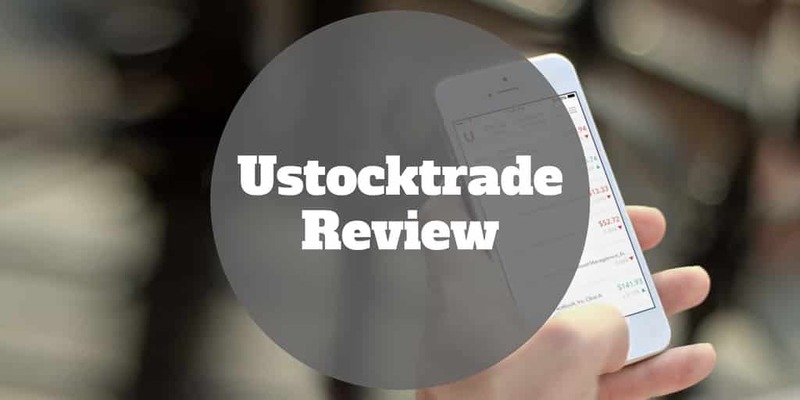 Ustocktrade complies with regulatory requirements and is fully regulated by the SEC too. One big “gotcha” you should be aware of however when using Ustocktrade or any other peer-to-peer trading platform is that liquidity may dry up during periods of volatility. That’s a fancy way of saying that if the market experiences a big selloff, such as a stock market crash, and you want to sell your stock, you may not be able to find a buyer. Unlike a standard exchange, such as the NYSE, which is comprised of market makers that are required to provide market liquidity in order to ensure a stable market, meaning you can always buy and sell stock – even if the prices are unfavorable – no such requirement exists for Alternative Trading Systems. So how does Ustocktrade get around this liquidity problem? Superusers fulfill a similar, though not identical, role to market makers in a traditional market. “Superusers” are the “made-up” label Ustocktrade uses to describe members on its platform who may step in to provide liquidity, similar to a market maker. However, it is important to note that while Superusers may have the deep pockets to purchase a big chunk of stock that you want to offload, they are not required to create a market or set price like a market maker is obligated to do. Instead, the Superuser simply steps in, if they wish, to act as the counterparty to complete a trade at the NBBO (National Best Bid & Offer) price. Beyond low transaction costs, Ustocktrade has a philanthropic mission to support a non-profit, The Cainan Foundation, whose mission is to financially support disadvantaged children. A big advantage Ustocktrade has over brokers is faster settlement times. When you buy and sell securities with a traditional broker, it may take as many as three days for the transaction to settle in your account. By contrast, Ustocktrade operates on a T+0 settlement time frame, meaning that trade settlements are conducted same day. Compared to big name brokers, Ustocktrade settlement times and commissions compare very favorably. Beyond fast settlement times and lower transaction costs, another compelling reason to use Ustocktrade is that its founding purpose is to financially support The Cainan Foundation, a 501(c)(3) nonprofit that builds schools exclusively for disadvantaged children. Another nice feature of Ustocktrade is its virtual trading platform, called Ustocktrain. It is a free trading simulator chockful of video tutorials to help you build your trading skills using virtual currency so you don’t have to risk a dime. The visual interface is easy-of-use and the overall user experience deserves an A-grade from start to finish. It’s virtually impossible to get lost whether you are trading real money or virtual capital. But a drawback is you will need to fund your account in cash and are limited to transfers of $10,000 so the platform caters best to smaller account holders. Ustocktrade provides a low-cost way of buying and selling shares by directly matching buyers and sellers, thereby cutting out the costs of middlemen. ✅ Innovative Alternative To Brokers: Ustocktrade offers an innovative alternative market to buying and selling shares beyond what brokers offer. ❌ Liquidity: While Superusers with deep pockets may provide a similar purpose to market makers, they are not obligated to step in when the market is volatile, creating risk that you may not be able to sell your shares. ✅ Low Cost: Per trade transaction fees of $1 in addition to monthly membership fees of $1 are significantly lower than the commissions costs charged by most traditional brokerage firms. ❌ Limited Securities: Only stocks, ETFs, and ETNs can be traded on the Ustocktrade platform. ✅ No Minimum Deposit: You can get started at no cost and won’t be hit with hidden fees, such as maintenance fees, that are so common on brokerage platforms. ❌ Transfer Limit: Ustocktrade has a dollar limit of $10,000 per transfer. So the platform is best suited to users with smaller accounts. ✅ Virtual Trading Platform: Ustocktrain is the virtual trading platform offered by Ustocktrade, and lets you traded an unlimited amount at no cost using virtual currency to build your trading skills. ❌ Cash Funding: You won’t be able to transfer stocks in-kind to Ustocktrade but instead will need to fund your account in cash, which may cause a tax liability when selling shares in your brokerage account. If you wish to trade options, futures, forex, or bonds, you will need to select another trading platform, such as thinkorswim or tastyworks. Ustocktrade charges a monthly fee of $1 in addition to a per trade charge of $1 to buy or sell stocks, ETFs, and ETNs. Ustocktrade is a peer-to-peer stock trading platform that directly matches the orders of buyers and sellers at lower cost than most traditional brokerage platforms. You can trade stocks, ETFs, and ETNs on the platform at a cost of just $1 per trade in addition to a monthly cost of $1. New traders can get started on Ustocktrain, the virtual trading platform offered by Ustocktrade, at no cost to help build trading skills. Perhaps the biggest concern is the liquidity risk if markets are volatile and a Superuser doesn’t step in to act as a counterparty. It is possible during market selloffs that nobody will take the other side of the trade to purchase your stock. A bonus offered by Ustocktrade is that it supports a charity designed to educate disadvantaged kids.